We awoke this morning to catch the 8am bullet train to Hiroshima, approximately a 2 hour journey. 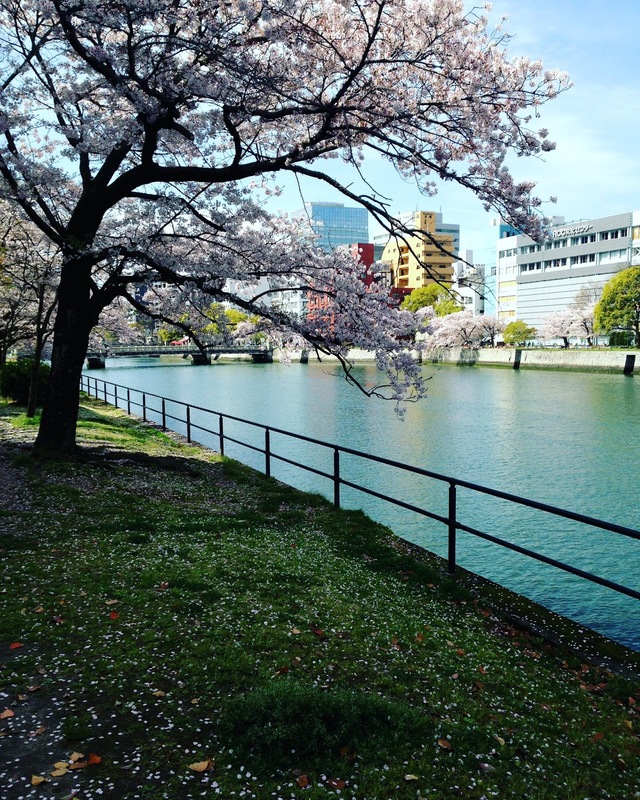 We arrived at the station and started to walk to our hotel, alongside the cherry blossom lined river. 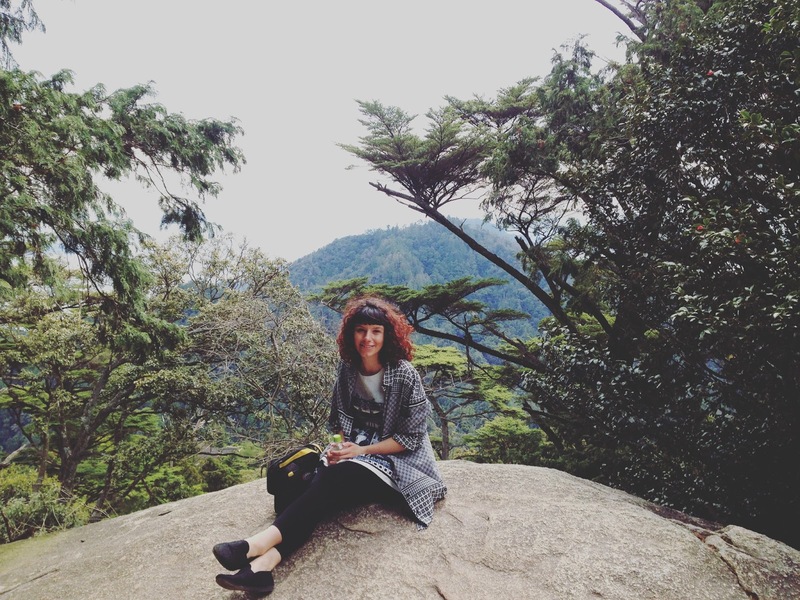 I was struck by how incredibly beautiful Hiroshima was and instantly wishing we could spend longer than the one night we had arranged. Walking alongside the river was so peaceful, the sun was shining and there were a few people having picnics on the banks. We were staying the night at the Court Hotel. It was easy to find, just off the river and only a 10 minute walk from the station. The rooms were clean and a good size with a nice bathroom. The three of us stayed in a triple room and we felt we had more than enough space. It was clear Hiroshima was a big baseball town, the ‘Carps’ were advertised absolutely everywhere. There were a lot of places that sold the memorabilia. I’ve been to a baseball match in America and although the sport itself doesn’t interest me I thought it was a really good atmosphere. I think I’d like to go to a match in Japan and see how it compares. 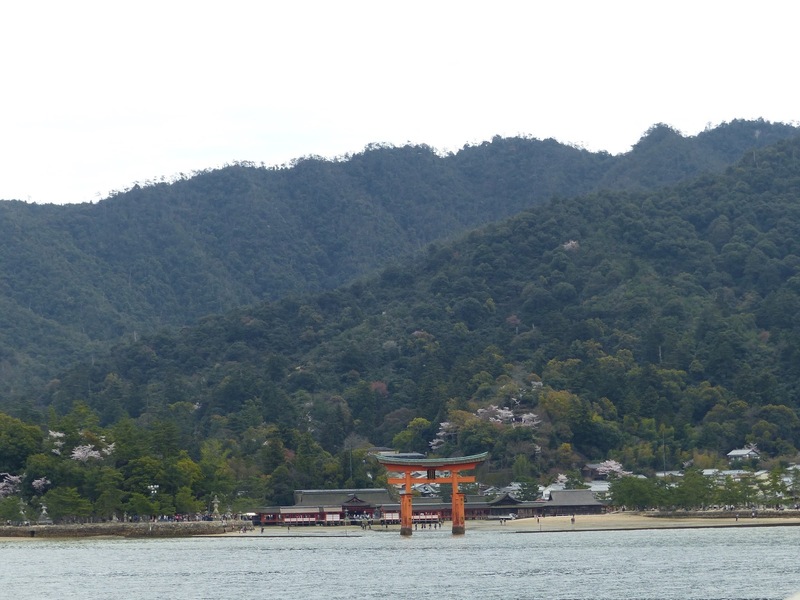 We walked back to the station and got the JR line to Miyajima Guchi, from where it was just a short walk to the pier from where we caught a ferry to Miyajima Island. All the transport was covered under our rail pass. We came off the ferry to many deer, just like in Nara. These ones seemed quite aggressive though and one nearly took Adam’s t-shirt right off him! 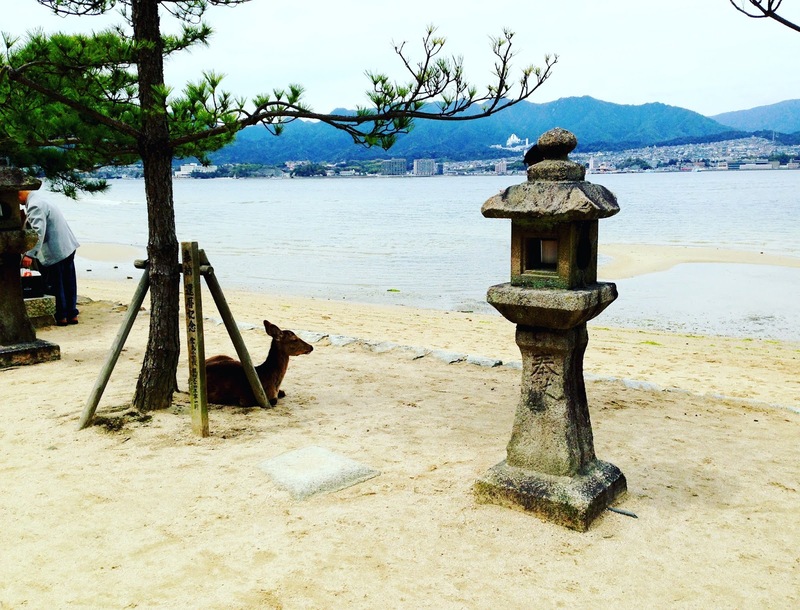 I was laughing but a Japanese man came to warn us that the deer in Miyajima were very serious! We were hungry so started to look around for somewhere to eat. 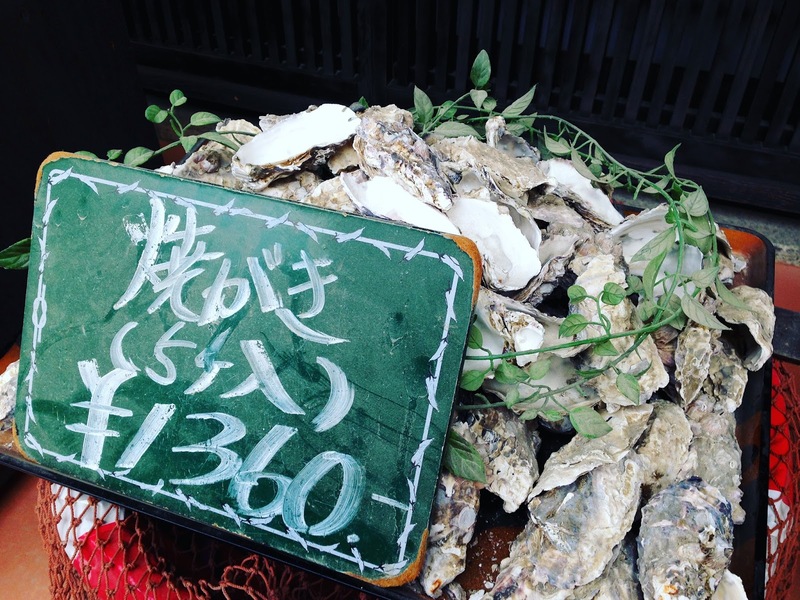 Seafood was obviously quite big in Miyajima and in particular oysters seemed to be the catch of the day. 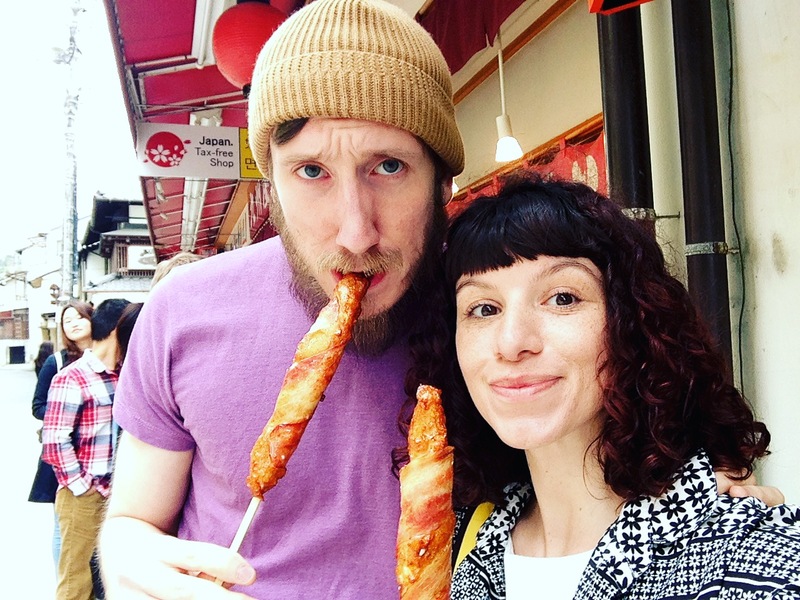 We ended up stopping at a stall selling some kind of stick wrapped in cheese and bacon. I didn’t know what it was but it smelt delicious so Adam and I stopped and bought one each. It turned out to be squid, my first experience of it in fact, and it was soooo delicious!! 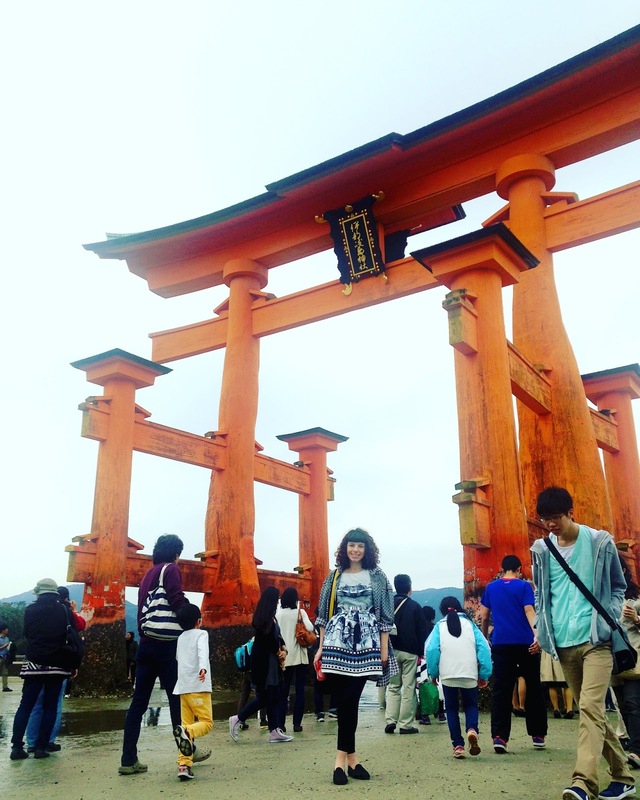 We then headed over to look at the Itsukushima shrine with it’s iconic floating gate for which Miyajima is known. The tide happened to be out and so you could walk right up to the gate. It gave a unique viewpoint and we hoped that when we returned later it would be submerged. 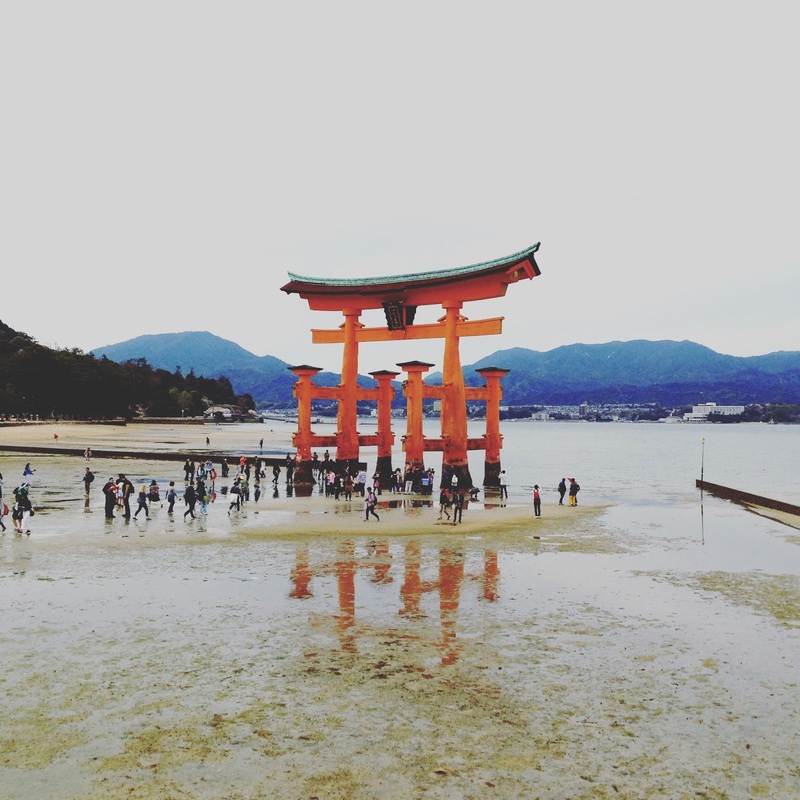 The torii gate floats away from the island because of the fact that the island of Miyajima was once considered so sacred that commoners were not allowed to go on it in order to maintain its purity. The idea was that pilgrims would be able to visit the shrine without setting foot on the island. The island still holds a purity. No deaths or births are meant to be recorded on it. 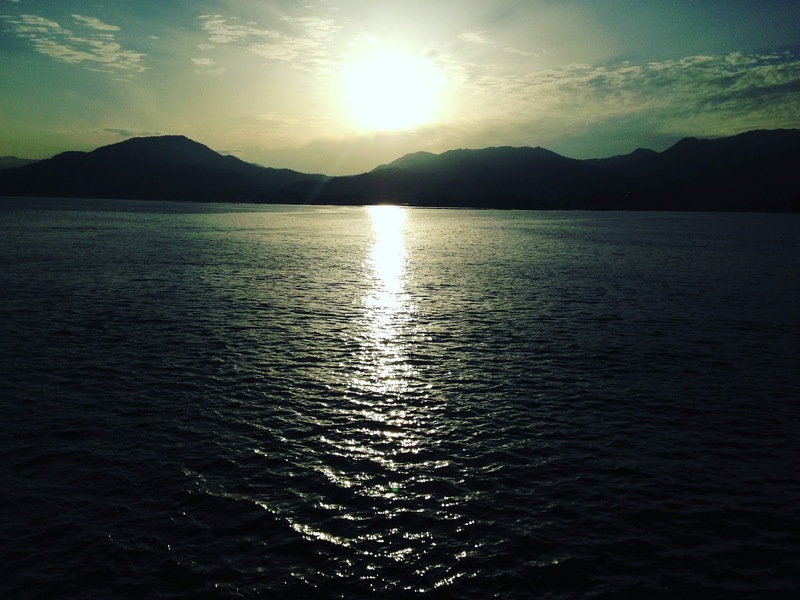 Pregnant women are asked to return to the mainland as their due date nears, as are the terminally ill and the elderly, and burials on the island are forbidden. Interesting! 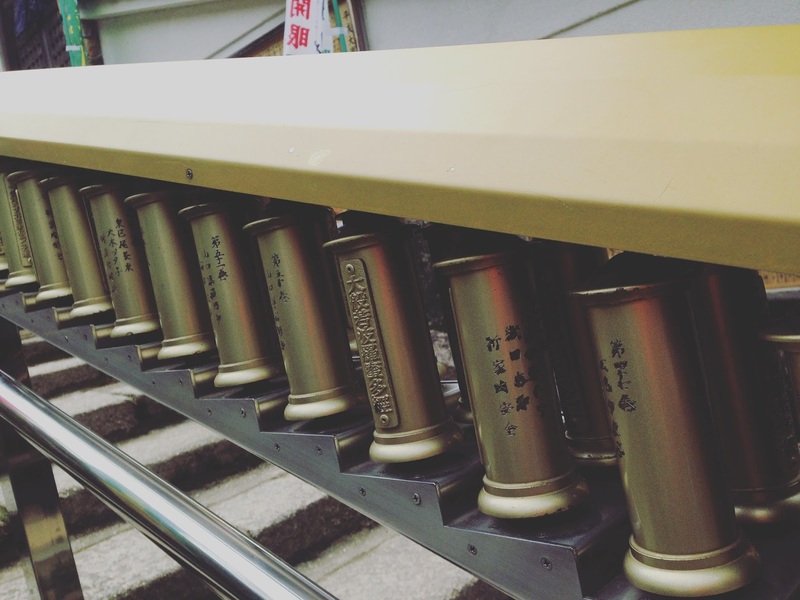 We then walked to the Daisho-in temple. They had a staircase you could ascend and as you climbed there was a spinning metal handrail that was inscribed with scripture. The idea being as you spun it you would be able to read the whole thing, well if you read Japanese that is! 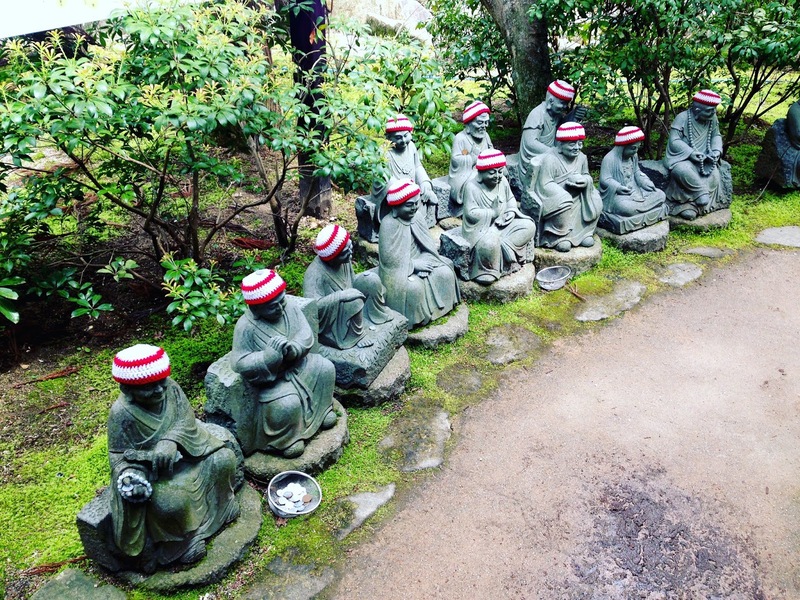 Daisho-in temple was quaint. Unfortunately I was forced to endure my first experience (and luckily my last) of a squat toilet whilst there. 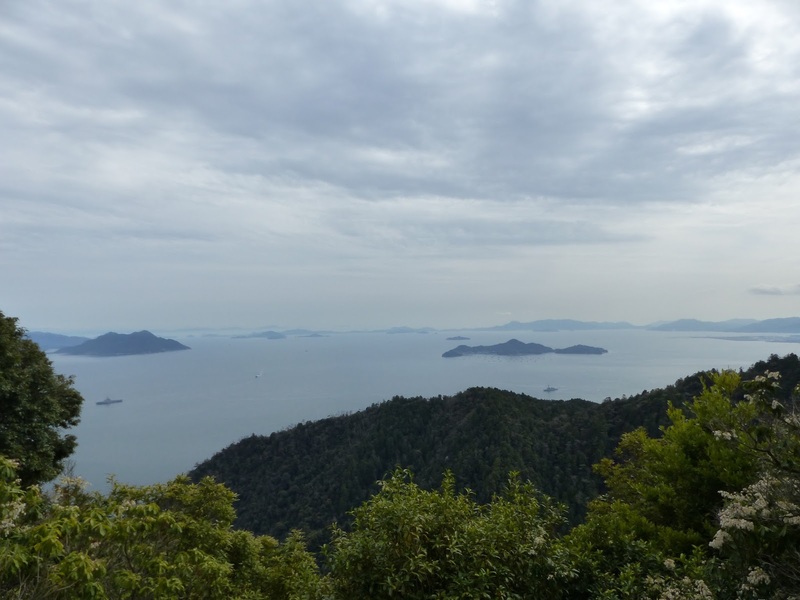 Anyway the main reason for our visit to the Daisho- in temple (and indeed the reason for my visit to the squat toilet) was it was the starting point for us to ascend up Mount Misen. 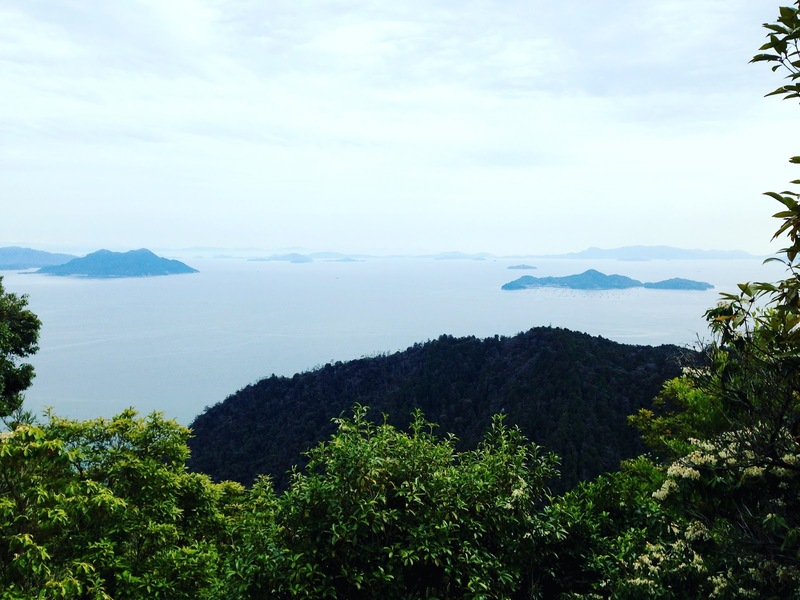 The mountain is the highest point in the island and was guaranteed to give us some beautiful views. The course that started behind the Daisho-in temple was meant to be the easiest…however easy doesn’t really come into it. 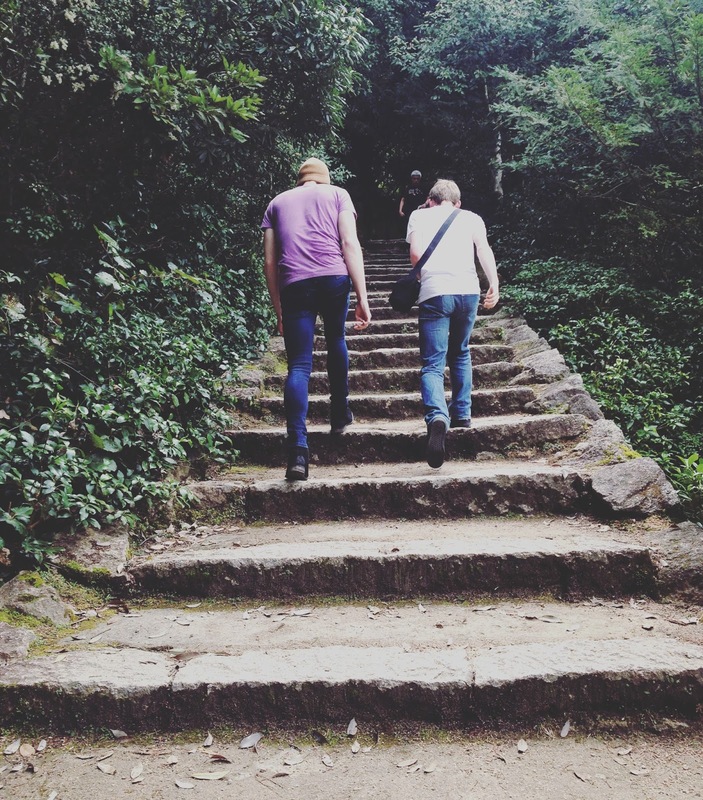 It wasn’t that is was steep or hard to climb but it was just stairs. Row after row after row of stairs. 3km of stairs. 90 minutes of stairs. My thighs burned, I didn’t think I’d be able to raise them ever again. They seemed endless, at one point after about 20 minutes there was a marker telling us the distance we had come but that was all we saw from then onto the top. We ached, we were hot and we were tired. Adam wanted to give up, Dudley and I wanted to push on. We finally reached a little clearing with a map that told us we were close. Also reading the map was an Israeli couple in their 70’s. They spoke amazing English and more than that they were in amazing shape. The woman was a yoga instructor and spurred me on, telling me women were strong and I had to be strong. Without them I don’t know if we would have made it to the top! We finally reached the top. 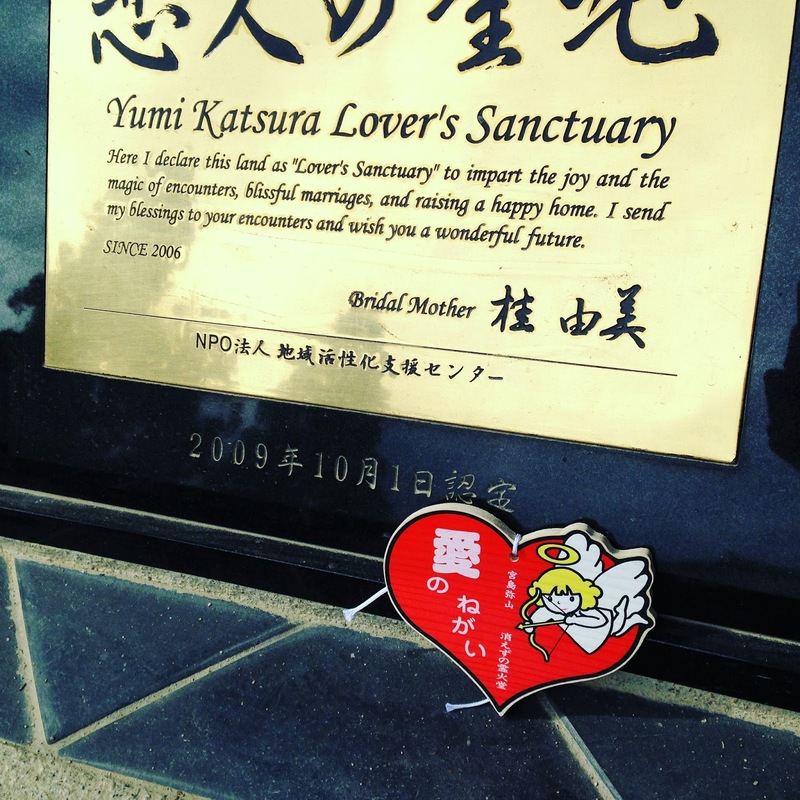 There was a chance to buy a drink and we bought a little wooden prayer block at the ‘Lovers Sanctuary’. There were some nice temples to see at the top but of course what we’d really come for was the view and it didn’t disappoint. It was so serene, it was really breathtaking. The pictures can’t at all do justice to just how astounding it looked. On the way back down we chickened out descending it by foot and took the ropeway instead haha. Once we got back to the ground we had a walk around the shops, they were quite affordable and sold some cute things. I noticed a new kitkat flavour, orange. 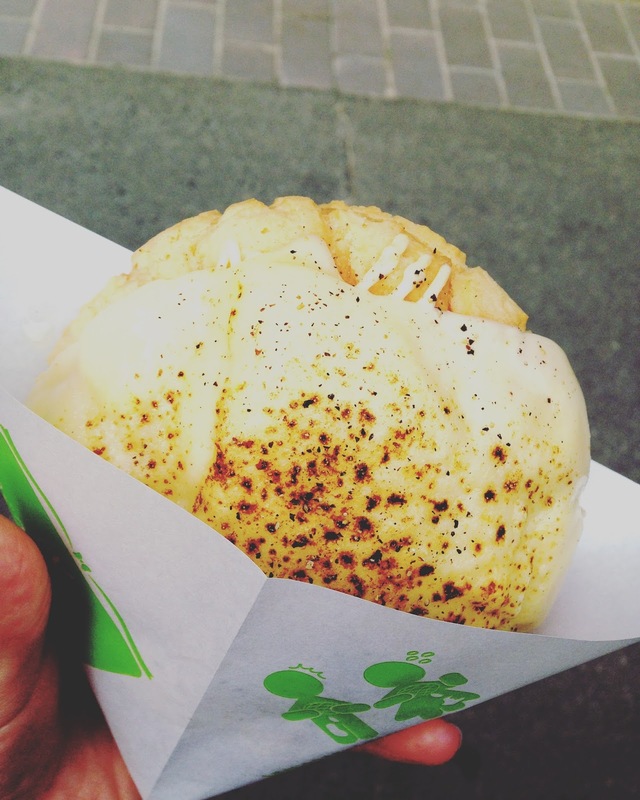 We were pretty hungry and our noses guided us towards a stall selling melonpans, a type of sweet bread. People were having them with ice cream but we decided to go for a savoury option and the vendor made us a grilled cheese sandwich, using a blowtorch! It was heavenly. By this point the island had started to shut up, the shops close quite early, so we caught the ferry back over to the mainland and travelled back to our hotel. We ended our evening in bed watching Japanese tv shows. Although nothing was in English we were able to understand a surprising amount from the actions, it was all very expressive. It was very funny. We were all absolutely exhausted from our wonderful day!